We are pleased to inform you that North Area of The Singapore Scout Association is organizing a World Scout Day Celebration for all Cubs/Scout Units in the Area. Since school ends at 10 a.m. on Friday, 27 January, there will be no CCA this coming Friday. 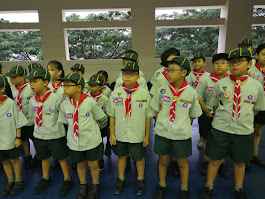 Subsequently, cub scouts please collect the consent form from Mrs Pwee's locker #115 (near Level 2 Lost and Found corner) from 25 January onwards and return to scout pigeon hole outside the KRC staff room before next Friday 3 February.